IN the world of art, miniature paintings occupy an eminent place. In the field of miniature paintings, portraits are prominent. Among these, equestrian portraits attract more attention. Great masters, down the ages, have been drawing and painting equestrian portraits of historical heroes, spiritual masters, crusaders, warriors and other prominent personages to charm their patrons. These have been preserved by lovers of art in public and private collections. Thus, we come across quite a good number of equestrian portraits done by master artists of various schools of art, which flourished in different parts of India. Horses and their riders have been drawn by artists in a variety of ways not only to express their own concepts but also to capture the imagination of their patrons. Equestrian miniature paintings can be broadly classified into two classes — those depicting groups and portraits showing single individuals. Group scenes include those from the battle front, hunting, sports, expeditions, royal processions, wedding processions, etc. The riders have been shown in a variety of postures such as fighting, chasing, returning victorious, playing chogan (a polo-like game), enjoying pleasure rides, sitting gracefully on horseback, and so on. Similarly, horses have been drawn in a number of ways like standing, apace, trotting, galloping, prancing and jumping. In groups, usually the king, commander or the main person has been portrayed prominently, while others have been given lesser space and significance. In case of individual portraits, the artist could devote fully to one person and draw more minute details of the figure, dress, ornaments, weapons, etc. 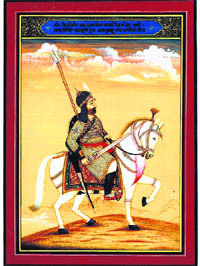 Very fine equestrian paintings were done by artists of the Mughal atelier. Those depicting Akbar, Jehangir, Shah Jahan and some other Mughal princes are remarkable. But, due to Aurangzeb’s fanaticism, many masters migrated from Delhi. Some went to the Deccan and others spread out in the surrounding areas of North India in search of patronage. In the adjoining area of Haryana, we find artistic activity at Dadri (which, in the Mughal empire, was a pargana in the suba of Delhi), and then in the, then, newly-formed princely states of Jhajjar, Jind, Patiala, Nabha, etc, to name a few, and beyond up to Lahore. Quite a good number of equestrian miniatures produced in these areas exhibit excellent workmanship. There are equestrian portraits of Guru Hargobind, Guru Gobind Singh, Maharaja Ranjit Singh, Bhai Sahib Singh Bedi of Una and Guru Sadhu Singh of Kartarpur to name a few. In the cis-Sutlej region also, a number of remarkable equestrian paintings are extant. Painting depicting ‘victorious crusade of Sri Guru Mahabahu Rao Lalsinghji of Dadri’, exhibits fine workmanship. He has been shown holding a trishul in his right hand. The nishan (royal mark) and flag, held by the armed followers, have swastik and om, respectively, on these. There are good equestrian portraits of Maharaja Karam Singh of Patiala, Raja Sangat Singh of Jind and Sardar Ajit Singh Raees of Ladwa. While the former three show fine sober depiction, the last one is fascinating. Raees Ajit Singh, who wears a rich and shining colourful dress, rides a prancing horse well-decorated with necklaces and costly brocade. 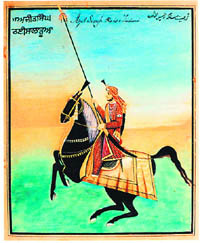 In a magnificent portrait of Sri Guru Ajanubahu Rao Dhansinghji of Dadri, he has been shown fully armed, putting on a zira-buktar and steel helmet, holding a large drawn sword in right hand and reigns of the horse with the left. A gun hangs on his right, while a dagger has been tied with the kamar-band. The shield and trishul have been tied on the back. The armour and arms with golden workmanship are bejewelled. Minuteness of details on the dress, ornaments and arms is superb. The finely decorated and bewitchingly beautiful white horse has been shown with a raised foreleg. Another magnificent miniature depicts Maharaja Narinder Singh of Patiala, exhibiting stately grandeur. Both the rider and the horse have been gorgeously dressed and decorated with golden dress, ornaments and brocade. A remarkable painting shows royal procession of Maharaja Narinder Singh, seated on elephant, while some horsemen form a part of the procession. The equestrian portraits of Raja Sangat Singh of Jind, Raees Ajit Singh of Ladwa and Maharaja Narinder Singh of Patiala were given by the renowned conservator of cultural heritage, Rajguru Sri Rao Uttamsinghji of Dadri (who also remained Hon. Advisor to the Punjab State Museum in Joint Punjab) to the Government Museums at Patiala and Chandigarh, later on, along with many other masterpieces of art, for the benefit of students, researchers, scholars and the public. The equestrian miniature portraits have not lost appeal even in the modern times of automobile revolution and existence of numerous large-size oil paintings on canvas. In many of the masterpieces, fine workmanship and delightful depiction leave a lasting impression on the minds of the beholders.